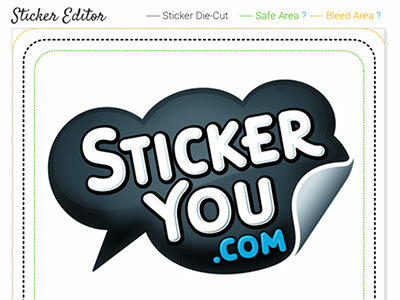 The bleed and safe zone lines are visible in the sticker editor, but what do they mean? The safe zone line is designated by a green line inside the die-cut. Keep all elements within this zone unless you want them to bleed off the edge of the sticker. The bleed zone is designated by an orange line outside the die-cut. If you have a colour or element you would like to reach the edge of the sticker, please ensure it reaches this line. Die-cuts do shift a bit at the time of printing, and this bleed zone ensures that the colour goes all the way to the edge on all sides. Without it, you may have a small area of white on one side of your sticker. Watch a video tutorial explaining Bleed and Safe Zones and the eyedropper button to fill your background here.